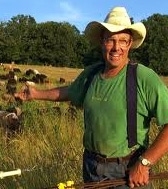 Join Joel Salatin and special guest, local Tom Delehanty of Pollo Real Ranch in Socorro, NM as we discuss the power of local food systems. Biosecurity, food borne pathogens, energy, integrity, humane husbandry: local food can correct it all. But to really be a credible percentage of the global food system, it must develop six integrated components: production, processing, marketing, accounting, distribution, and patrons. Building a local food system that works requires aromatic and aesthetic production models that reintroduce the butcher, baker, and candlestick maker into the community. Economies of scale in collaborative food shed distribution compete with corporate volume. And patrons must rediscover their kitchens, eating seasonally and relearning domestic culinary arts.